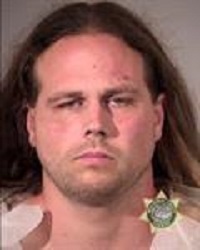 On Friday, May 27, Jeremy Joseph Christian accosted a Muslim woman, then stabbed three men in Portland. Two have died – one a 23-year-old, the other a veteran and father of four. The third victim’s injury reportedly missed being fatal by one millimeter. This morning at his arraignment, the grand jury returned a 15-count indictment that could grow longer – and could include the death penalty. Some are surprised to learn that this white supremacist supports Bernie Sanders, opposes the free market, and hates Christianity. Those familiar with the teachings of fascism, or the modern racialist movement, should not be jolted. Christian noted his support for Sanders and Green Party candidate Jill Stein on social media. Jeremy Joseph Christian’s mugshot from the Multnomah County (Oregon) Sheriff’s Office. Despite that reference and his misleading surname, Christian despised the Christian faith, as well as other major world religions. He once called for a “Monotheist Holocaust” encompassing Jews, Christians, and Muslims. While most people understand a neo-Nazi prejudice against Judaism and Islam, fewer know of its anti-Christian teachings. However, economic concerns motivated much of Christian’s activism. The Oregonian paraphrased Shane Burley, the author of a new book on fascism, who concluded that the attacker “supported Sanders because he was against globalization” – that is, free trade. Christian also expressed “solidarity” with Standing Rock protesters against the Dakota Access Pipeline. In the Nazi imagination, the free market is synonymous with perfidious Jewish merchants. 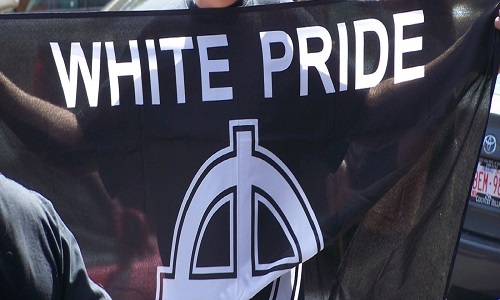 Thus, it must be brought under the control of a “pure” Aryan superstate. [E]liminate the current practice of damaging and poisoning life and environment. Provide honest aid to farmers and other business people, and shall restore to all citizens rightful land ownership. Make the necessary provisions for the aged, who have been impoverished by fraud (inflation). Confiscate all unearned wealth, stolen by fraud or usury and that which is gain from war. Nationalize all monopolies and multi-national interest[s]. Immediately bring about land reform and completely prohibit land speculation and ownership of land and industry by racial aliens. All of this echoed the original 25 Point Program of the Nazi Party. The 1920 document called for the “abolition of unearned (work and labour) incomes,” “the total confiscation of all war profits,” “the nationalization of all (previous) associated industries (trusts),” “a division of profits of all heavy industries,” “an expansion on a large scale of old age welfare,” enabling “every capable and industrious German to obtain higher education,” “land reform,” and the death penalty for usurers. “We demand the formation of a strong central power in the Reich,” it concluded. Seeing the gathering threat, Ludwig von Mises became an outspoken critic of racial collectivism before fleeing the Nazis. He dedicated a chapter of Human Action to rejecting race-based philosophy (“racial polylogism”) alongside Marxist dialectical materialism. If the fascist corporatist state differs from orthodox Marxism, so does the platform of the contemporary American Left. Sanders did not campaign on nationalizing industries – merely comprehensively regulating them, taxing them, and redistributing their fruits. And whether one believes the economy is “rigged” by an ethnic clique or a capitalist cabal, the ideologies are built upon the same envy and propose similar government interventionist policies to make things “fair.” It should come as little surprise that there is some overlap between the two movements now, as there was in the 1930s. To be clear, nothing in this essay should imply that Bernie Sanders is a Nazi, or that Democratic Socialists like Sanders or Stein favor fascism. The two philosophies are distinct in their methodologies, platforms, and intended results. On a practical level, the diffusion of power – between levels of bureaucracy, between the government and civil society, and between public and private economic resources – is the only way to preserve the right to life, freedom of conscience, the free exercise of religion, and freedom of expression. On a deeper level, collectivist terror can only be fought only by recognizing the inherent human dignity of all people. Barbarism must be overcome with gentleness, which emanates from a heart illumined by the light of God’s presence. The two fatalities in Portland are a tragic loss. They should remind us of the harm that could befall innocents were its perpetrator’s ideology armed, not with a folding knife, but with the full economic and military resources of the State.